Bottom line: If you want good cycle infrastructure you are going to have to make submissions and encourage others to do so as well. The purpose of this route is to allow those who wish to cycle from Heathcote to the central city a way to do so while minimizing the NIMBY backlash from drivers and merchants who are convinced that they can’t exist in a world where motorised transport is not privileged. Just what is meant by a major cycle way? The MCR’s are to offer cycling for the 8-80’s while also allowing people who need or want to cycle commute efficiently that option. The MCR’s should also leave footpaths to pedestrians. MCR’s are to offer reasonably direct routes well connected to a city wide cycle network. This route appears long and circuitous. At 8 km’s in length it is about 1 km longer than most on road options. At 15 km/h that is only an extra 4 minutes. Many of us already choose indirect routes for safety and pleasant riding. Starting out on the city end with wide separated on road cycle lanes illustrates one way to make cycling work. Using quiet streets to avoid traffic chaos is also utilised. Where this project falls down is in relying on too many narrow width shared bidirectional paths. Ending on Martindales Road in the Heathcote Valley without connecting to any other MCR or even cycle network does not impress. None the less, it is a beginning and it needs support. The route starts off on Fitzgerald and Ferry Roads with separated cycle lanes and a much improved intersection. Great and thanks to CCC for proving they can do cycle infrastructure. From a short section of bidirectional shared path on Wilsons Road it converts to ‘Green Streets’ or ‘Quiet Streets’. These are residential roads with a 30 km/h limit, reduced on street parking and offering potentially enjoyable cycling assuming drivers are respectful. There several signalised crossings of major roads where strategically placed in road sensors are designed to facilitate quick crossings. Once it gets to Cumnor Terrace and onwards it degrades to bidirectional shared paths, most around 3 metres wide. While pedestrian and cycle traffic may be OK with this narrow width initially, there is little room for and no mention of expansion when more people take up both modes. It finally goes off road at Kennaway Road where it follows Tunnel Road down to the main south rail line and ends on Martindales Road. CCC had originally hoped to use the main south rail line as part of the cycle network. Kiwi Rail raised safety issues as did the reality that much of the rail route goes through isolated industrial areas where some users would feel vulnerable, especially at night. Let CCC know that you appreciate their effort, but also ask for any changes or make suggestions. The numbers of submissions received do impact what is done. Note how well the NIMBY’s have done getting on street parking to prevail over road safety on other MCR’s. Thanks for 2.1m wide separated cycle paths on Ferry Road. Bi-directional shared paths should only be used when absolutely no other alternatives are available and must be at least 4m wide when used. Please plan for future expansion. Hook up the Heathcote end to Main Road at Bridal Path Road. At a minimum install cycle route signs, better yet paint in the lanes. 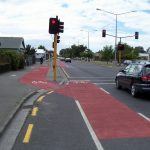 Consult with people who cycle to best focus resources on routes which make sense. Nb: NIMBY, not in my back yard, opposition to the MCR’s has been successful in changing routes and restoring on street parking in spite of safety concerns. NIMBY opposition is already forming against this project. Councillors need to hear from the many people who cycle, or would like to cycle, if the MCR’s are to be achieved. Yes, you personally need to both make a submission and to encourage others to do so. Thanks. 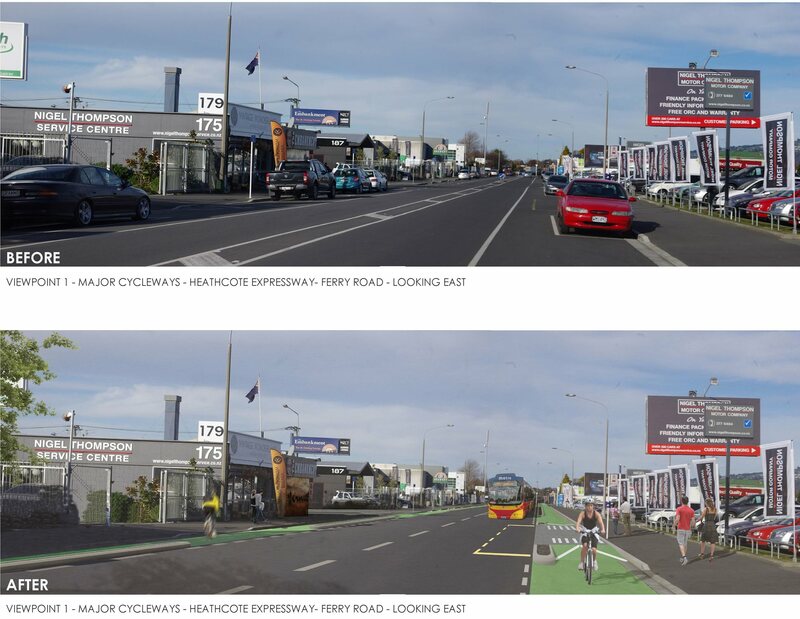 If you want to know more about this cycleway and the Rapanu /Shag Rock Cycleway Stage 2 also out for consultation, then why not join Spokes Canterbury for a guided ride along both routes this Sunday 11th, starting at 10am from C1 Espresso (cnr High/Tuam). This doesn’t really pick up any of the schools or shops at or close to Opawa Road? The Tannery is a nice place to visit but commuting wise this seems out of the way from the desire line down Opawa Road?? I agree with Anne, the Tannery is a nice place to visit but for everyday needs and for getting the kids to school Opawa Road makes more sense. I’ve made a point of going down Rutland street lately, just because I can.